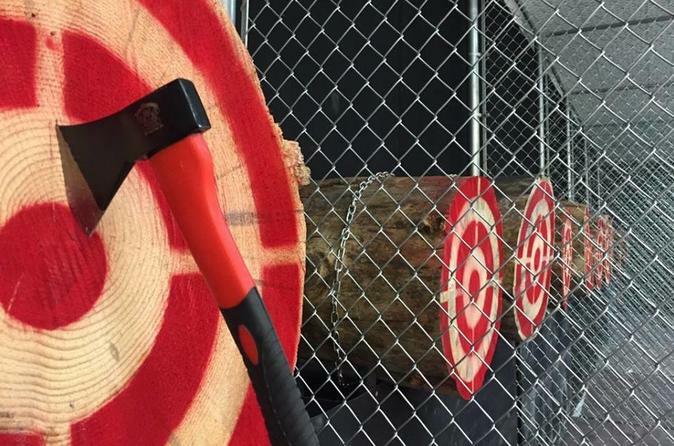 Channel your inner lumber jack at this indoor axe throwing facility in Las Vegas. Choose between a 1- or 2-hour sessions which includes instruction from professional trainers and the use of the facilities standard axes. Not only will you learn all the different throws and trick shots but you will also learn different games such as Black-Jaxe and Canadian Cricket. After arriving at the local facility, check-in with the staff and then meet your trainer who will go over a safety briefing before taking you to your designated lanes. From there, you'll learn four basic throws and practice until you're comfortable. Next the trainer will teach you or your party the different games to create come competition among everyone. After your choice of session your are more than welcome to take pictures around the facility before leaving.